The Guild of Battlefield Guides has a number of annual awards for both members and the tour industry. The Richard Holmes Award perpetuates the memory of the first Patron of the Guild, Professor Richard Holmes. The award marks the pivotal role he played in the founding and development of the Guild. In addition it recognises the significant contribution that he made to broaden the appeal of visiting battlefields and the promotion of a much wider understanding of military history among the general public. The award takes the form of a silver figurine of an Essex Yeomanry soldier of the 1914 era – A Tommy of the Territorial Army. The selection of his design refers to the fact that Professor Richard Holmes served in the Essex Yeomanry and in much of his work immortalised the spirit and achievements of the British Tommy. The Award is given to a Guild member(s) who, in the Chairman’s personal opinion deserves recognition for their personal contribution to the improvement and further development of the Guild. This annual award will be presented at the Guild AGM – however, the award is not restricted to events or a contribution made in a particular year. The recipient may be recognised for their contribution or achievements made over a number of years. 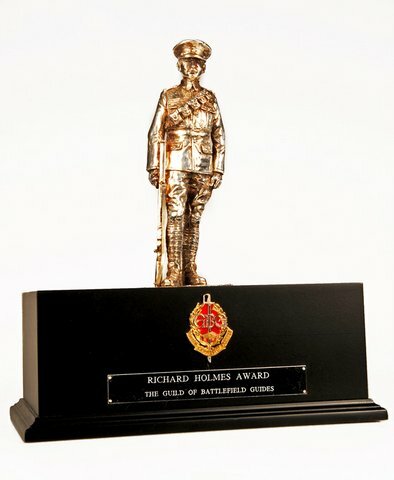 The Richard Holmes Award is restricted to recipients who are members of the Guild at the time of the award. Any Guild Member from any membership category may be selected by the Chairman to receive this award. Selection of the recipient will be made solely by the Chairman. The Richard Holmes Award will be presented by the Chairman at the Guild AGM.